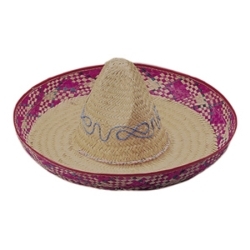 This authentic style sombrero is perfect for Mexican costumes, Cinco de Mayo costumes and parties, a fun and silly costume hat, and much much more. The authentic style sombrero is made of natural straw with assorted colors and patterns so hat may vary from the one that is pictured. Be sure to check out the rest of our Mexican and Cinco de Mayo costumes and costume accessories to go along with this hat! The authentic style sombrero has a 7” crown, a 5.5” brim, and will fit a head measurement of up to 23”.